The number of outstanding ordinary shares of the registrant as of November 1, 2018 was 29,463,722. Wave Life Sciences Ltd. (together with its subsidiaries, “Wave” or the “Company”) is a biotechnology company with an innovative and proprietary synthetic chemistry drug development platform that the Company is using to rationally design, develop and commercialize a broad pipeline of first-in-class or best-in-class nucleic acid therapeutic candidates for genetically defined diseases. Nucleic acid therapeutics are a growing and innovative class of drugs that have the potential to address diseases that have historically been difficult to treat with small molecule drugs or biologics. Nucleic acid therapeutics, or oligonucleotides, are comprised of a sequence of nucleotides that are linked together by a backbone of chemical bonds. The Company is initially developing oligonucleotides that target genetic defects to either reduce the expression of disease-promoting proteins or transform the production of dysfunctional mutant proteins into the production of functional proteins. The Company was incorporated in Singapore on July 23, 2012 and has its principal U.S. office in Cambridge, Massachusetts. The Company was incorporated with the purpose of combining two commonly held companies, Wave Life Sciences USA, Inc. (“Wave USA”), a Delaware corporation (formerly Ontorii, Inc.), and Wave Life Sciences Japan, Inc. (“Wave Japan”), a company organized under the laws of Japan (formerly Chiralgen., Ltd.), which occurred on September 13, 2012. On May 31, 2016, Wave Life Sciences Ireland Limited (“Wave Ireland”) was formed as a wholly-owned subsidiary of Wave Life Sciences Ltd. On April 3, 2017, Wave Life Sciences UK Limited (“Wave UK”) was formed as a wholly-owned subsidiary of Wave Life Sciences Ltd. The Company’s primary activities since inception have been developing an innovative and proprietary synthetic chemistry drug development platform to design, develop and commercialize nucleic acid therapeutic programs, advancing the Company’s neurology franchise, expanding the Company’s research and development activities into additional therapeutic areas including ophthalmology and hepatic, advancing programs into the clinic, furthering clinical development of such clinical-stage programs, building the Company’s intellectual property, recruiting personnel and assuring adequate capital to support these activities. The Company is subject to risks common to companies in the biotechnology industry including, but not limited to, new technological innovations, protection of proprietary technology, establishment of internal manufacturing capabilities, dependence on key personnel, compliance with government regulations and the need to obtain additional financing. The Company’s therapeutic programs will require significant additional research and development efforts, including extensive preclinical and clinical testing and regulatory approval, prior to commercialization of any product candidates. These efforts require significant amounts of additional capital, adequate personnel infrastructure and extensive compliance-reporting capabilities. There can be no assurance that the Company’s research and development will be successfully completed, that adequate protection for the Company’s intellectual property will be obtained, that any products developed will obtain necessary government regulatory approval or that any approved products will be commercially viable. Even if the Company’s product development efforts are successful, it is uncertain when, if ever, the Company will generate significant revenue from product sales. The Company operates in an environment of rapid change in technology and substantial competition from pharmaceutical and biotechnology companies. In addition, the Company is dependent upon the services of its employees and consultants. The Company has prepared the accompanying consolidated financial statements in conformity with generally accepted accounting principles in the United States of America (“U.S. GAAP”) and in U.S. dollars. The significant accounting policies described in the Company’s audited financial statements as of and for the year ended December 31, 2017, and the notes thereto, which are included in the Company’s Annual Report on Form 10-K for the year ended December 31, 2017, filed with the Securities and Exchange Commission (“SEC”) on March 12, 2018, as amended (the “2017 Annual Report on Form 10-K”), have had no material changes during the three and nine months ended September 30, 2018, other than the Company’s adoption of ASC 606 (as defined below) which is discussed in detail in this note. The accompanying interim consolidated balance sheet as of September 30, 2018, the related interim consolidated statements of operations and comprehensive loss for the three and nine months ended September 30, 2018 and 2017 and cash flows for the nine months ended September 30, 2018 and 2017, and the related interim information contained within the notes to the consolidated financial statements have been prepared in accordance with the rules and regulations of the SEC for interim financial information. Accordingly, they do not include all of the information and the notes required by U.S. GAAP for complete financial statements. The financial data and other information disclosed in these notes related to the three and nine months ended September 30, 2018 and 2017 are unaudited. In the opinion of management, the unaudited interim consolidated financial statements reflect all adjustments, consisting of normal and recurring adjustments, necessary for the fair presentation of the Company’s financial position and results of operations for the three and nine months ended September 30, 2018 and 2017. The results of operations for the interim periods are not necessarily indicative of the results to be expected for the year ending December 31, 2018 or any other interim period or future year or period. The Company’s consolidated financial statements include the accounts of the Company and its wholly-owned subsidiaries. All significant intercompany balances and transactions have been eliminated in consolidation. Effective January 1, 2018, the Company adopted Accounting Standards Codification (“ASC”) Topic 606, Revenue from Contracts with Customers (“ASC 606”), using the full retrospective transition method. Under this method, the Company revised its consolidated financial statements for the years ended December 31, 2017 and 2016, and applicable interim periods within those years, as if ASC 606 had been effective for those periods. This standard applies to all contracts with customers, except for contracts that are within the scope of other standards, such as leases, insurance, and financial instruments. Under ASC 606, an entity recognizes revenue when its customer obtains control of promised goods or services, in an amount that reflects the consideration that the entity expects to receive in exchange for those goods or services. To determine revenue recognition for arrangements that an entity determines are within the scope of ASC 606, the entity performs the following five-step analysis: (i) identify the contract(s) with a customer; (ii) identify the performance obligations in the contract; (iii) determine the transaction price; (iv) allocate the transaction price to the performance obligations in the contract; and (v) recognize revenue when (or as) the entity satisfies a performance obligation. The Company only applies the five-step analysis to contracts when it is probable that the entity will collect the consideration to which it is entitled in exchange for the goods or services it transfers to the customer. At contract inception, once the contract is determined to be within the scope of ASC 606, the Company assesses the goods or services promised within each contract, determines those that are performance obligations, and assesses whether each promised good or service is distinct. The Company then recognizes as revenue the amount of the transaction price that is allocated to the respective performance obligation when (or as) the performance obligation is satisfied. The Company has entered into collaboration agreements for research, development, and commercial services, under which the Company licenses certain rights to its product candidates to third parties. The terms of these arrangements typically include payment to the Company of one or more of the following: non-refundable, upfront license fees; reimbursement of certain costs; customer option exercise fees; development, regulatory and commercial milestone payments; and royalties on net sales of licensed products. Any variable consideration is constrained, and therefore, the cumulative revenue associated with this consideration is not recognized until it is deemed not to be at significant risk of reversal. In determining the appropriate amount of revenue to be recognized as the Company fulfills its obligations under each of its agreements for which the collaboration partner is also a customer, the Company performs the following steps: (i) identification of the promised goods or services in the contract; (ii) determination of whether the promised goods or services are performance obligations, including whether they are distinct in the context of the contract; (iii) measurement of the transaction price, including the constraint on variable consideration; (iv) allocation of the transaction price to the performance obligations; and (v) recognition of revenue when (or as) the Company satisfies each performance obligation. As part of the accounting for these arrangements, the Company must use significant judgment to determine: (a) the number of performance obligations based on the determination under step (ii) above; (b) the transaction price under step (iii) above; and (c) the timing of satisfaction of performance obligations as a measure of progress in step (v) above. The Company uses significant judgment to determine whether milestones or other variable consideration, except for royalties, should be included in the transaction price as described further below. The transaction price is allocated to the optional goods and services the Company expects to provide. The Company uses estimates to determine the timing of satisfaction of performance obligations. Licenses of intellectual property: In assessing whether a promise or performance obligation is distinct from the other promises, the Company considers factors such as the research, development, manufacturing and commercialization capabilities of the customer and the availability of the associated expertise in the general marketplace. In addition, the Company considers whether the customer can benefit from a promise for its intended purpose without the receipt of the remaining promise, whether the value of the promise is dependent on the unsatisfied promise, whether there are other vendors that could provide the remaining promise, and whether it is separately identifiable from the remaining promise. For licenses that are combined with other promises, the Company utilizes judgment to assess the nature of the combined performance obligation to determine whether the combined performance obligation is satisfied over time or at a point in time and, if over time, the appropriate method of measuring progress for purposes of recognizing revenue. The Company evaluates the measure of progress each reporting period and, if necessary, adjusts the measure of performance and related revenue recognition. Research and development services: If an arrangement is determined to contain a promise or obligation for the company to perform research and development services, the Company must determine whether these services are distinct from other promises in the arrangement. In assessing whether the services are distinct from the other promises, the Company considers the capabilities of the customer to perform these same services. In addition, the Company considers whether the customer can benefit from a promise for its intended purpose without the receipt of the remaining promise, whether the value of the promise is dependent on the unsatisfied promise, whether there are other vendors that could provide the remaining promise, and whether it is separately identifiable from the remaining promise. For research and development services that are combined with other promises, the Company utilizes judgment to assess the nature of the combined performance obligation to determine whether the combined performance obligation is satisfied over time or at a point in time and, if over time, the appropriate method of measuring progress for purposes of recognizing revenue. The Company evaluates the measure of progress each reporting period and, if necessary, adjusts the measure of performance and related revenue recognition. Customer options: If an arrangement is determined to contain customer options that allow the customer to acquire additional goods or services, the goods and services underlying the customer options are not considered to be performance obligations at the outset of the arrangement, as they are contingent upon option exercise. The Company evaluates the customer options for material rights, that is, the option to acquire additional goods or services for free or at a discount. If the customer options are determined to represent a material right, the material right is recognized as a separate performance obligation at the outset of the arrangement. The Company allocates the transaction price to material rights based on the standalone selling price. As a practical alternative to estimating the standalone selling price when the goods or services are both (i) similar to the original goods and services in the contract and (ii) provided in accordance with the terms of the original contract, the Company allocates the total amount of consideration expected to be received from the customer to the total goods or services expected to be provided to the customer. Amounts allocated to any material right are not recognized as revenue until the option is exercised and the performance obligation is satisfied. Milestone payments: At the inception of each arrangement that includes milestone payments, the Company evaluates whether a significant reversal of cumulative revenue provided in conjunction with achieving the milestones is probable, and estimates the amount to be included in the transaction price using the most likely amount method. If it is probable that a significant reversal of cumulative revenue would not occur, the associated milestone value is included in the transaction price. Milestone payments that are not within the control of the Company or the licensee, such as regulatory approvals, are not considered probable of being achieved until those approvals are received. For other milestones, the Company evaluates factors such as the scientific, clinical, regulatory, commercial, and other risks that must be overcome to achieve the particular milestone in making this assessment. There is considerable judgment involved in determining whether it is probable that a significant reversal of cumulative revenue would not occur. At the end of each subsequent reporting period, the Company reevaluates the probability of achievement of all milestones subject to constraint and, if necessary, adjusts its estimate of the overall transaction price. Any such adjustments are recorded on a cumulative catch-up basis, which would affect revenues and earnings in the period of adjustment. Royalties: For arrangements that include sales-based royalties, including milestone payments based on a level of sales, and the license is deemed to be the predominant item to which the royalties relate, the Company recognizes revenue at the later of (i) when the related sales occur, or (ii) when the performance obligation to which some or all of the royalty has been allocated has been satisfied (or partially satisfied). To date, the Company has not recognized any royalty revenue resulting from any of its licensing arrangements. Contract costs: The Company recognizes as an asset the incremental costs of obtaining a contract with a customer if the costs are expected to be recovered. As a practical expedient, the Company recognizes the incremental costs of obtaining a contract as an expense when incurred if the amortization period of the asset that it otherwise would have recognized is one year or less. To date, the Company has not incurred any incremental costs of obtaining a contract with a customer. The recently issued accounting pronouncements described in the Company’s audited financial statements as of and for the year ended December 31, 2017, and the notes thereto, which are included in the 2017 Annual Report on Form 10-K, have had no material changes during the nine months ended September 30, 2018, except as described below. In February 2016, the Financial Accounting Standards Board (the “FASB”) issued Accounting Standards Update (“ASU”) No. 2016-02, Leases (“ASU 2016-02”), which was further clarified in July 2018 when the FASB issued Accounting Standards Update No. 2018-10, Codification Improvements to Topic 842, Leases (“ASU 2018-10”) and Accounting Standards Update No. 2018-11, Leases (Topic 842)—Targeted Improvements (“ASU 2018-11”). ASU 2016-02, ASU 2018-10 and ASU 2018-11 require a lessee to recognize assets and liabilities on the balance sheet for operating leases and changes many key definitions, including the definition of a lease. The update includes a short-term lease exception for leases with a term of 12 months or less, in which a lessee can make an accounting policy election not to recognize lease assets and lease liabilities. Lessees will continue to differentiate between finance leases (previously referred to as capital leases) and operating leases, using classification criteria that are substantially similar to the previous guidance. For lessees, the recognition, measurement, and presentation of expenses and cash flows arising from a lease have not significantly changed from previous U.S. GAAP. Lessees and lessors are required to recognize and measure leases at the beginning of the earliest period presented using a modified retrospective approach. The modified retrospective approach includes a number of optional practical expedients that entities may elect to apply, as well as transition guidance specific to nonstandard leasing transactions. ASU 2016-02, ASU 2018-10 and ASU 2018-11 are effective for fiscal years beginning after December 15, 2018, and interim periods within those fiscal years. The Company is currently evaluating the impact of adopting ASU 2016-02, ASU 2018-10 and ASU 2018-11 on its consolidated financial statements. In February 2018, the FASB issued Accounting Standards Update No. 2018-02, Income Statement—Reporting Comprehensive Income (Topic 220): Reclassification of Certain Tax Effects from Accumulated Other Comprehensive Income (“ASU 2018-02”), which allows companies to make a one-time reclassification of the stranded tax effects (as defined by ASU 2018-02) from accumulated other comprehensive income to retained earnings as a result of the tax legislation enacted in December 2017, commonly known as the “Tax Cuts and Jobs Act” (the “Tax Act”), and requires certain disclosures about the stranded tax effects. The new guidance is effective for fiscal years beginning after December 15, 2018, including interim periods within those fiscal years. The Company is currently evaluating the potential impact that the adoption of ASU 2018-02 may have on its consolidated financial statements. In March 2018, the FASB issued Accounting Standards Update No. 2018-05, Income Taxes (Topic 740): Amendments to SEC Paragraphs Pursuant to SEC Staff Accounting Bulletin No. 118 (“ASU 2018-05”). The standard amends Accounting Standards Codification 740, Income Taxes (“ASC 740”), to provide guidance on accounting for the tax effects of the Tax Act pursuant to Staff Accounting Bulletin No. 118. The Company is currently evaluating the new guidance included in ASU 2018-05, but does not expect it to have a material impact on its consolidated financial statements. In November 2018, the FASB issued Accounting Standards Update No. 2018-18, Collaborative Arrangements (Topic 808): Clarifying the Interaction between Topic 808 and Topic 606 (“ASU 2018-18”). The standard amends Accounting Standards Codification 808, Collaborative Agreements and Accounting Standards Codification 606, Revenue from Contracts with Customers, to clarify the interaction between collaborative arrangement participants that should be accounted for as revenue under ASC 606. In transactions when the collaborative arrangement participant is a customer in the context of a unit of account, revenue should be accounted for using the guidance in Topic 606. The amendments in Update No. 2018-18 are effective for fiscal years beginning after December 15, 2019, and interim periods within those fiscal years. The Company is currently evaluating the new guidance included in ASU 2018-18, but does not expect it to have a material impact on its consolidated financial statements. In May 2014, the FASB issued Accounting Standards Update No. 2014-09, which amends the guidance for accounting for revenue from contracts with customers. This ASU supersedes the revenue recognition requirements in ASC Topic 605, Revenue Recognition, (“ASC 605”), and creates a new topic, ASC 606, Revenue from Contracts with Customers. In 2015 and 2016, the FASB issued additional ASUs related to ASC 606 that delayed the effective date of the guidance and clarified various aspects of the new revenue guidance, including principal versus agent considerations, identifying performance obligations, and licensing, and they include other improvements and practical expedients. The Company adopted this new standard on January 1, 2018 using the full retrospective transition method. As a result of adopting ASC 606 on January 1, 2018, the Company has revised its comparative financial statements for the prior year as if ASC 606 had been effective for that period. As a result, the following financial statement line items for fiscal year 2017 were affected. The most significant changes relate to the Company’s revenue recognition pattern for the Pfizer Collaboration Agreement (as defined in Note 4) and the accounting for milestone payments. Under ASC 605, the Company was recognizing the revenue allocated to each unit of accounting on a straight-line basis over the period the Company is expected to complete its obligations. Under ASC 606, the Company is recognizing the revenue allocated to each performance obligation over time, measuring progress using an input method over the period the Company is expected to complete each performance obligation. Under ASC 605, the Company recognized revenue related to milestone payments as the milestone was achieved, using the milestone method. Under ASC 606, the Company performs an assessment of the probability of milestone achievement at each reporting date and determines whether the cumulative revenue related to the milestone is at risk of significant reversal. See Note 4 for further discussion of the adoption of this standard. In October 2016, the FASB issued Accounting Standards Update No. 2016-16, Income Taxes (Topic 740): Intra-Entity Transfers of Assets Other Than Inventory (“ASU 2016-16”). Under the new guidance, companies are required to recognize the income tax consequences of an intra-entity transfer of an asset, other than inventory, when the transfer occurs, even though the pre-tax effects of that transaction are eliminated in consolidation. The amendments are effective for fiscal years, and interim periods within those fiscal years, beginning after December 15, 2017. The Company adopted ASU 2016-16 effective January 1, 2018, which resulted in a $0.4 million cumulative-effect adjustment to retained earnings related to the intercompany sale of intellectual property on October 1, 2017. In November 2016, the FASB issued Accounting Standards Update No. 2016-18, Statement of Cash Flows (Topic 230): Restricted Cash (“ASU 2016-18”). ASU 2016-18 requires that an entity explain the changes in the total of cash, cash equivalents, restricted cash and restricted cash equivalents on the statement of cash flows. Therefore, amounts generally described as restricted cash and restricted cash equivalents should be included with cash and cash equivalents when reconciling the beginning-of-period and end-of-period total amounts shown on the statement of cash flows. This ASU is effective for annual and interim periods beginning after December 15, 2017. The Company adopted ASU 2016-18 effective January 1, 2018 on a retrospective basis, which resulted in a change in presentation of restricted cash within the Company’s unaudited consolidated statements of cash flows. The Wave Life Sciences Ltd. 2014 Equity Incentive Plan, as amended (the “2014 Plan”), authorizes the board of directors or a committee of the board of directors to grant incentive share options, non-qualified share options, share appreciation rights, restricted awards, which includes restricted shares and restricted share units (“RSUs”), and performance awards to eligible employees, consultants and directors of the Company. Options generally vest over periods of one to four years, and any options that are forfeited or cancelled are available to be granted again. The contractual life of options is generally five or ten years from the grant date. RSUs generally vest over a period of one or four years, and any RSUs that are forfeited are available to be granted again. During the nine months ended September 30, 2018, 659,170 options and 309,247 RSUs were granted to employees of the Company. As of September 30, 2018, 1,695,424 ordinary shares remained available for future grant under the 2014 Plan. In May 2016, the Company entered into a Research, License and Option Agreement, as amended (the “Pfizer Collaboration Agreement”), with Pfizer Inc. (“Pfizer”). Pursuant to the terms of the Pfizer Collaboration Agreement, the Company and Pfizer agreed to collaborate on the discovery, development and commercialization of stereopure oligonucleotide therapeutics for up to five programs (the “Pfizer Programs”), each directed at a genetically-defined hepatic target selected by Pfizer (the “Pfizer Collaboration”). The Company received $10.0 million as an upfront license fee under the Pfizer Collaboration Agreement. Subject to option exercises by Pfizer, the Company may earn potential research, development and commercial milestone payments, plus royalties, tiered up to low double-digits, on sales of any products that may result from the Pfizer Collaboration. None of the payments under the Pfizer Collaboration Agreement are refundable. Simultaneously with the entry into the Pfizer Collaboration Agreement, the Company entered into a Share Purchase Agreement (the “Pfizer Equity Agreement,” and together with the Pfizer Collaboration Agreement, the “Pfizer Agreements”) with C.P. Pharmaceuticals International C.V., an affiliate of Pfizer (the “Pfizer Affiliate”). Pursuant to the terms of the Pfizer Equity Agreement, the Pfizer Affiliate purchased 1,875,000 of the Company’s ordinary shares (the “Shares”) at a purchase price of $16.00 per share, for an aggregate purchase price of $30.0 million. The Company did not incur any material costs in connection with the issuance of the Shares. Under the Pfizer Collaboration Agreement, the parties agreed to collaborate during a four-year research term. During the research term, the Company is responsible to use its commercially reasonable efforts to advance up to five programs through to the selection of clinical candidates. At that stage, Pfizer may elect to license any of these Pfizer Programs exclusively and obtain exclusive rights to undertake the clinical development of the resulting clinical candidates into products and the potential commercialization of any such products thereafter. In addition, the Company received a non-exclusive, royalty-bearing sublicensable license to use Pfizer’s hepatic targeting technology in any of the Company’s own hepatic programs that are outside the scope of the Pfizer Collaboration (the “Wave Programs”). If the Company uses this technology on the Wave Programs, Pfizer is eligible to receive potential development and commercial milestone payments from the Company. Pfizer is also eligible to receive tiered royalties on sales of any products that include Pfizer’s hepatic targeting technology. The stated term of the Pfizer Collaboration Agreement commenced on May 5, 2016 and terminates on the date of the last to expire payment obligation with respect to each Pfizer Program and, with respect to each Wave Program, expires on a program-by-program basis accordingly. Pfizer may terminate its rights related to a Pfizer Program under the Pfizer Collaboration Agreement at its own convenience upon 90 days’ notice to the Company. The Company may also terminate its rights related to a Wave Program at its own convenience upon 90 days’ notice to Pfizer. The Pfizer Collaboration Agreement may also be terminated by either party in the event of an uncured material breach of the Pfizer Collaboration Agreement by the other party. Pfizer nominated two hepatic targets upon entry into the Pfizer Collaboration in May 2016. The Pfizer Collaboration Agreement provides Pfizer with options to nominate up to three additional programs by making nomination milestone payments. Pfizer nominated the third, fourth and fifth hepatic targets in August 2016, March 2018 and April 2018, respectively. The Pfizer Collaboration is managed by a joint steering committee in which both parties are represented equally, which will oversee the scientific progression of each Pfizer Program up to the clinical candidate stage. During the four-year research term and for a period of two years thereafter, the Company has agreed to work exclusively with Pfizer with respect to using any of the Company’s stereopure oligonucleotide technology that is specific for the applicable hepatic target which is the basis of any Pfizer Program. Within 120 days of receiving a data package for a candidate under each nominated program, Pfizer may exercise an option to obtain a license to develop, manufacture and commercialize the program candidate by paying an exercise price per program. The Company assessed this arrangement in accordance with ASC 606 and concluded that the contract counterparty, Pfizer, is a customer. The Company identified the following promises under the arrangement: (1) the non-exclusive, royalty-free research and development license; (2) the research and development services for Programs 1 and 2; (3) the program nomination options for Programs 3, 4 and 5; (4) the research and development services associated with Programs 3, 4 and 5; (5) the options to obtain a license to develop, manufacture and commercialize Programs 1 and 2; and (6) the options to obtain a license to develop, manufacture and commercialize Programs 3, 4 and 5. The research and development services for each of Programs 1 and 2 were determined to not be distinct from the research and development license and should be combined into a single performance obligation for each program. The promises under the Pfizer Collaboration Agreement relate primarily to the research and development required by the Company for each of the programs nominated by Pfizer. Additionally, the Company determined that the program nomination options for Programs 3, 4 and 5 were priced at a discount and, as such, provide material rights to Pfizer, representing three separate performance obligations. The research and development services associated with Programs 3, 4 and 5 and the options to obtain a license to develop, manufacture and commercialize Programs 3, 4 and 5 are subject to Pfizer’s exercise of the program nomination options for such programs and therefore do not represent performance obligations at the outset of the arrangement. The options to obtain a license to develop, manufacture and commercialize Programs 1 and 2 do not represent material rights; as such, they are not representative of performance obligations at the outset of the arrangement. Based on these assessments, the Company identified five performance obligations in the Pfizer Collaboration Agreement: (1) research and development services and license for Program 1; (2) research and development services and license for Program 2; (3) material right provided for the option to nominate Program 3; (4) material right provided for the option to nominate Program 4; and (5) material right provided for the option to nominate Program 5. At the outset of the arrangement, the transaction price included only the $10.0 million up-front consideration received. The Company determined that the Pfizer Collaboration Agreement did not contain a significant financing component. The program nomination option exercise fees for research and development services associated with Programs 3, 4 and 5 that may be received are excluded from the transaction price until each customer option is exercised. The potential milestone payments were excluded from the transaction price, as all milestone amounts were fully constrained at the inception of the Pfizer Collaboration Agreement. The exercise fees for the options to obtain a license to develop, manufacture and commercialize Programs 3, 4 and 5 that may be received are excluded from the transaction price until each customer option is exercised. The Company will reevaluate the transaction price at the end of each reporting period and as uncertain events are resolved or other changes in circumstances occur, and, if necessary, will adjust its estimate of the transaction price. During the three months ended September 30, 2017, it became probable that a significant reversal of cumulative revenue would not occur for a developmental milestone under the Pfizer Collaboration Agreement. At such time, the associated consideration was added to the estimated transaction price and allocated to the existing performance obligations, and the Company recognized a cumulative catch-up to revenue for this developmental milestone, representing the amount that would have been recognized had the milestone payment been included in the transaction price from the outset of the arrangement. The remainder will be recognized in the same manner as the remaining, unrecognized transaction price over the remaining period until each performance obligation is satisfied. The milestone was achieved in November 2017.
over time and, in management’s judgment, this input method is the best measure of progress towards satisfying the performance obligation. The amount allocated to the three material rights will be recognized as the underlying research and development services are provided commencing from the date that Pfizer exercises each respective option, or immediately as each option expires unexercised. The amounts received that have not yet been recognized as revenue are recorded in deferred revenue on the Company’s consolidated balance sheet. Pfizer nominated the third, fourth and fifth hepatic targets in August 2016, March 2018 and April 2018, respectively. Upon each exercise, the Company allocated the transaction price amount allocated to the material right at inception of the arrangement plus the program nomination option exercise fee paid by Pfizer at the time of exercising the option to a new performance obligation, which will be recognized as revenue as the research and development services are provided using the same method as the performance obligations relating to Programs 1 and 2. Through September 30, 2018, the Company had recognized revenue of $8.8 million as collaboration revenue in the Company’s consolidated statements of operations and comprehensive loss under the Pfizer Collaboration Agreement. During the three and nine months ended September 30, 2018, the Company recognized revenue of $1.0 million and $3.9 million, respectively, under the Pfizer Collaboration Agreement. The aggregate amount of the transaction price allocated to the Company’s partially unsatisfied performance obligations and recorded in deferred revenue at September 30, 2018 is $9.7 million, of which $6.7 million is included in current liabilities. The Company expects to recognize this amount according to FTE hours incurred, over the remaining research term, which is 19 months as of September 2018. In February 2018, Wave USA and Wave UK entered into a global strategic collaboration (the “Takeda Collaboration”) with Takeda Pharmaceutical Company Limited (“Takeda”), pursuant to which Wave USA, Wave UK and Takeda agreed to collaborate on the research, development and commercialization of oligonucleotide therapeutics for disorders of the Central Nervous System (“CNS”). The Takeda Collaboration provides Wave with at least $230.0 million in committed cash and Takeda with the option to co-develop and co-commercialize Wave’s CNS development programs in (1) Huntington’s disease (“HD”); (2) amyotrophic lateral sclerosis (“ALS”) and frontotemporal dementia (“FTD”); and (3) Wave’s discovery-stage program targeting ATXN3 for the treatment of spinocerebellar ataxia 3 (“SCA3”) (collectively, “Category 1 Programs”). In addition, Takeda will have the right to exclusively license multiple preclinical programs for CNS disorders, including Alzheimer’s disease and Parkinson’s disease (collectively, “Category 2 Programs”). In April 2018, the Takeda Collaboration became effective and Takeda paid Wave $110.0 million as an upfront payment. Takeda also agreed to fund Wave’s research and preclinical activities in the amount of $60.0 million during the four-year research term and to reimburse Wave for any collaboration-budgeted research and preclinical expenses incurred by Wave that exceed that amount. Simultaneously with Wave USA and Wave UK’s entry into the collaboration and license agreement with Takeda (the “Takeda Collaboration Agreement”), the Company entered into a share purchase agreement with Takeda (the “Takeda Equity Agreement,” and together with the Takeda Collaboration Agreement, the “Takeda Agreements”) pursuant to which it agreed to sell to Takeda 1,096,892 of its ordinary shares at a purchase price of $54.70 per share. In April 2018, the Company closed the Takeda Equity Agreement and received aggregate cash proceeds of $60.0 million. The Company did not incur any material costs in connection with the issuance of shares. With respect to Category 1 Programs, Wave will be responsible for researching and developing products and companion diagnostics for Category 1 Programs through completion of the first proof of mechanism study for such products. Takeda will have an exclusive option for each target and all associated products and companion diagnostics for such target, which it may exercise at any time through completion of the proof of mechanism study. If Takeda exercises this option, Wave will receive an opt-in payment and will lead manufacturing and joint clinical co-development activities and Takeda will lead joint co-commercial activities in the United States and all commercial activities outside of the United States. Global costs and potential profits will be shared 50:50 and Wave will be eligible to receive development and commercial milestone payments. In addition to its 50% profit share, Wave is eligible to receive option exercise fees and development and commercial milestone payments for each of the Category 1 Programs. 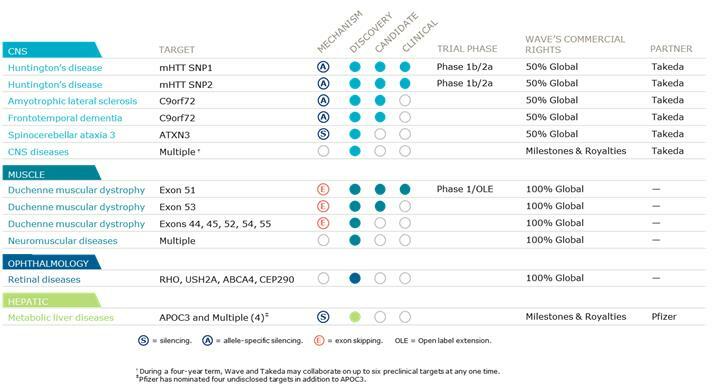 With respect to Category 2 Programs, Wave has granted Takeda the right to exclusively license multiple preclinical programs during a four-year research term (subject to limited extension for programs that were initiated prior to the expiration of the research term, in accordance with the Takeda Collaboration Agreement) (“Category 2 Research Term”). During that term, the parties may collaborate on preclinical programs for up to six targets at any one time. Wave will be responsible for researching and preclinically developing products and companion diagnostics directed to the agreed upon targets through completion of IND-enabling studies in the first major market country. Thereafter, Takeda will have an exclusive worldwide license to develop and commercialize products and companion diagnostics directed to such targets, subject to Wave’s retained rights to lead manufacturing activities for products directed to such targets. Takeda will fund Wave’s research and preclinical activities in the amount of $60.0 million during the research term and will reimburse Wave for any collaboration-budgeted research and preclinical expenses incurred by Wave that exceed that amount. Wave is also eligible to receive tiered high single-digit to mid-teen royalties on Takeda’s global commercial sales of products from each Category 2 Program. Under the Takeda Collaboration Agreement, each party grants to the other party specific intellectual property licenses to enable the other party to perform its obligations and exercise its rights under the Takeda Collaboration Agreement, including license grants to enable each party to conduct research, development and commercialization activities pursuant to the terms of the Takeda Collaboration Agreement. The term of the Takeda Collaboration Agreement commenced on April 2, 2018 and, unless terminated earlier, will continue until the date on which: (i) with respect to each Category 1 Program target for which Takeda does not exercise its option, the expiration or termination of the development program with respect to such target; (ii) with respect to each Category 1 Program target for which Takeda exercises its option, the date on which neither party is researching, developing or manufacturing any products or companion diagnostics directed to such target; or (iii) with respect to each Category 2 Program target, the date on which royalties are no longer payable with respect to products directed to such target. Takeda may terminate the Takeda Collaboration Agreement for convenience on 180 days’ notice, in its entirety or on a target-by-target basis. Subject to certain exceptions, each party has the right to terminate the Takeda Collaboration Agreement on a target-by-target basis if the other party, or a third party related to such party, challenges the patentability, enforceability or validity of any patents within the licensed technology that cover any product or companion diagnostic that is subject to the Takeda Collaboration Agreement. In the event of any material breach of the Takeda Collaboration Agreement by a party, subject to cure rights, the other party may terminate the Takeda Collaboration Agreement in its entirety if the breach relates to all targets or on a target-by-target basis if the breach relates to a specific target. In the event that Takeda and its affiliates cease development, manufacturing and commercialization activities with respect to compounds or products subject to the Takeda Collaboration Agreement and directed to a particular target, Wave may terminate the Takeda Collaboration Agreement with respect to such target. Either party may terminate the Takeda Collaboration Agreement for the other party’s insolvency. In certain termination circumstances, Wave would receive a license from Takeda to continue researching, developing and manufacturing certain products, and companion diagnostics. The Company assessed this arrangement in accordance with ASC 606 and concluded that the contract counterparty, Takeda, is a customer for Category 1 Programs prior to Takeda exercising its option, and for Category 2 Programs during the Category 2 Research Term. The Company identified the following material promises under the arrangement: (1) the non-exclusive, royalty-free research and development license for each Category 1 Program; (2) the research and development services for each Category 1 Program through completion of the first proof of mechanism study; (3) the exclusive option to license, co-develop and co-commercialize each Category 1 Program; (4) the right to exclusively license the Category 2 Programs; and (5) the research and preclinical development services of the Category 2 Programs through completion of IND-enabling studies. The research and development services for each Category 1 Program were determined to not be distinct from the research and development license and should therefore be combined into a single performance obligation for each Category 1 Program. The research and preclinical development services for the Category 2 Programs were determined to not be distinct from the exclusive licenses for the Category 2 Programs and should therefore be combined into a single performance obligation. Additionally, the Company determined that the exclusive option for each Category 1 Program was priced at a discount, and, as such, provide material rights to Takeda, representing three separate performance obligations. Based on these assessments, the Company identified seven performance obligations in the Takeda Collaboration Agreement: (1) research and development services through completion of the first proof of mechanism and non-exclusive research and development license for HD; (2) research and development services through completion of the first proof of mechanism and non-exclusive research and development license for ALS and FTD; (3) research and development services through completion of the first proof of mechanism and non-exclusive research and development license for SCA3; (4) the material right provided for the exclusive option to license, co-develop and co-commercialize HD; (5) the material right provided for the exclusive option to license, co-develop and co-commercialize ALS and FTD; (6) the material right provided for the exclusive option to license, co-develop and co-commercialize SCA3; and (7) the research and preclinical development services and right to exclusively license the Category 2 Programs. At the outset of the arrangement, the transaction price included the $110.0 million upfront consideration received and the $60.0 million of committed research and preclinical funding for the Category 2 Programs. The Company determined that the Takeda Collaboration Agreement did not contain a significant financing component. The option exercise fees to license, co-develop and co-commercialize each Category 1 Program that may be received are excluded from the transaction price until each customer option is exercised. The potential milestone payments were excluded from the transaction price, as all milestone amounts were fully constrained at the inception of the Takeda Collaboration Agreement. The Company will reevaluate the transaction price at the end of each reporting period and as uncertain events are resolved or other changes in circumstances occur, if necessary, will adjust its estimate of the transaction price. Revenue associated with the research and development services for each Category 1 Program performance obligation is being recognized as the research and development services are provided using an input method, according to the costs incurred on each Category 1 Program and the total costs expected to be incurred to satisfy each Category 1 Program performance obligation. Revenue associated with the research and preclinical development services for the Category 2 Programs performance obligation is being recognized as the research and preclinical development services are provided using an input method, according to the costs incurred on Category 2 Programs and the total costs expected to be incurred to satisfy the performance obligation. The transfer of control for these performance obligations occurs over time and, in management’s judgment, this input method is the best measure of progress towards satisfying the performance obligations. The amount allocated to the material right for each Category 1 Program option will be recognized on the date that Takeda exercises each respective option, or immediately as each option expires unexercised. The amounts received that have not yet been recognized as revenue are recorded in deferred revenue on the Company’s consolidated balance sheet. During the three and nine months ended September 30, 2018, the Company recognized revenue of $3.5 million and $6.9 million, respectively, as collaboration revenue in the Company’s consolidated statements of operations and comprehensive loss under the Takeda Collaboration Agreement. The aggregate amount of the transaction price allocated to the Company’s unsatisfied and partially unsatisfied performance obligations and recorded in deferred revenue at September 30, 2018 is $163.1 million, of which $96.6 million is included in current liabilities. The Company expects to recognize revenue for the portion of the deferred revenue that relates to the research and development services for each Category 1 Program and the Category 2 Programs as costs are incurred, over the remaining research term. The Company expects to recognize revenue for the portion of the deferred revenue that relates to the material right for each Category 1 Program option upon Takeda’s exercise of such option, or immediately as each option expires unexercised. The aggregate amount of the transaction price included in accounts receivable at September 30, 2018 is $60.0 million, of which $10.0 million is included in current assets. The Company applies the two-class method to calculate its basic and diluted net loss per share attributable to ordinary shareholders, as its Series A preferred shares are participating securities. The two-class method is an earnings allocation formula that treats a participating security as having rights to earnings that otherwise would have been available to ordinary shareholders. However, for the periods presented, the two-class method does not impact the net loss per ordinary share as the Company was in a net loss position for each of the periods presented and holders of Series A preferred shares do not participate in losses. Basic loss per share is computed by dividing net loss attributable to ordinary shareholders by the weighted-average number of ordinary shares used in computing net loss per share attributable to ordinary shareholders. The Company’s potentially dilutive shares, which include outstanding share options to purchase ordinary shares, RSUs and Series A preferred shares, are considered to be ordinary share equivalents and are only included in the calculation of diluted net loss per share when their effect is dilutive. The Company is a Singapore multi-national company subject to taxation in the United States and various other jurisdictions. During the three months ended September 30, 2018 and 2017, the Company recorded no income tax benefit or provision and an income tax benefit of $0.4 million, respectively. No income tax benefit or provision was recorded during the three months ended September 30, 2018 as a result of having a full valuation in all jurisdictions. The income tax benefit recorded during the three months ended September 30, 2017 was the result of the implementation of a revised international corporate structure aligned with the Company’s international operations. During the nine months ended September 30, 2018 and 2017, the Company recorded an income tax provision of $0.2 million and $1.0 million, respectively. The income tax provision recorded during the nine months ended September 30, 2018 was mainly the result of return to provision adjustments related to the filing of Wave Japan’s 2017 tax return. The income tax provision recorded during the nine months ended September 30, 2017 was primarily the result of the establishment of a valuation allowance against our U.S. deferred tax assets. The Company recorded no income tax benefits for the net operating losses incurred during the three and nine months ended September 30, 2018 in Singapore, the United States, the United Kingdom or Ireland, due to its uncertainty of realizing a benefit from those items. The Company recorded no income tax benefits for the net operating losses incurred during the three and nine months ended September 30, 2017 in Singapore, Japan, the United Kingdom or Ireland, due to its uncertainty of realizing a benefit from those items. The Company’s reserves related to taxes and its accounting for uncertain tax positions are based on a determination of whether and how much of a tax benefit taken by the Company in its tax filings or positions is more-likely-than-not to be realized following resolution of any potential contingencies present related to the tax benefit. Pursuant to the terms of various service agreements with Shin Nippon Biomedical Laboratories Ltd., one of the Company’s shareholders, and its affiliates (together “SNBL”), the Company paid SNBL less than $0.1 million and $0.1 million during the three months ended September 30, 2018 and 2017, respectively, and $1.3 million and $0.2 million during the nine months ended September 30, 2018 and 2017, respectively, for contract research services provided to the Company and its affiliates. In 2012, the Company entered into a consulting agreement for scientific advisory services with Dr. Gregory L. Verdine, one of the Company’s founders and a member of the Company’s board of directors. The consulting agreement does not have a specific term and may be terminated by either party upon 14 days’ prior written notice. Pursuant to the consulting agreement, the Company pays Dr. Verdine approximately $13 thousand per month, plus reimbursement of certain expenses. The following discussion and analysis of our financial condition and results of operations should be read in conjunction with our financial statements and related notes appearing elsewhere in this Quarterly Report on Form 10-Q and in our Annual Report on Form 10-K for the year ended December 31, 2017, filed with the Securities and Exchange Commission (“SEC”) on March 12, 2018, as amended (the “2017 Annual Report on Form 10-K”). Some of the information contained in this discussion and analysis or set forth elsewhere in this Quarterly Report on Form 10-Q, including information with respect to our plans and strategy for our business, includes forward-looking statements that involve risks and uncertainties. As a result of many factors, including those factors set forth in the “Risk Factors” section of this Quarterly Report on Form 10-Q, our actual results could differ materially from the results described in, or implied by, these forward-looking statements. As used in this Quarterly Report on Form 10-Q, unless otherwise stated or the context otherwise indicates, references to “Wave,” the “Company,” “we,” “our,” “us” or similar terms refer to Wave Life Sciences Ltd. and our wholly-owned subsidiaries. This Quarterly Report on Form 10-Q contains forward-looking statements within the meaning of Section 27A of the Securities Act of 1933, as amended, and Section 21E of the Securities Exchange Act of 1934, as amended, that relate to future events or to our future operations or financial performance. Any forward-looking statement involves known and unknown risks, uncertainties and other factors that may cause our actual results, levels of activity, performance or achievements to differ materially from any future results, levels of activity, performance or achievements expressed or implied by such forward-looking statement. In some cases, forward-looking statements are identified by the words “anticipate,” “believe,” “continue,” “could,” “estimate,” “expect,” “future,” “goals,” “intend,” “likely,” “may,” “might,” “ongoing,” “objective,” “plan,” “potential,” “predict,” “project,” “seek,” “should,” “strategy,” “target,” “will” and “would” or the negative of these terms, or other comparable terminology intended to identify statements about the future, although not all forward-looking statements contain these identifying words. Forward-looking statements include statements, other than statements of historical fact, about, among other things: our ability to fund our future operations; our financial position, revenues, costs, expenses, uses of cash and capital requirements; our need for additional financing or the period for which our existing cash resources will be sufficient to meet our operating requirements; the success, progress, number, scope, cost, duration, timing or results of our research and development activities, preclinical studies and clinical trials, including the timing for initiation or completion of or availability of results from any preclinical studies and clinical trials or for submission, review or approval of any regulatory filing; the timing of, and our ability to, obtain and maintain regulatory approvals for any of our product candidates; the potential benefits that may be derived from any of our product candidates; our strategies, prospects, plans, goals, expectations, forecasts or objectives; the success of our collaborations with third parties; any payment that our collaboration partners may make to us; our ability to identify and develop new product candidates; our intellectual property position; our commercialization, marketing and manufacturing capabilities and strategy; our ability to develop sales and marketing capabilities; our estimates regarding future expenses and needs for additional financing; our ability to identify, recruit and retain key personnel; our financial performance; developments and projections relating to our competitors in the industry; our liquidity and working capital requirements; and the expected impact of new accounting standards. Although we believe that we have a reasonable basis for each forward-looking statement contained in this report, we caution you that these statements are based on our estimates or projections of the future that are subject to known and unknown risks and uncertainties and other important factors that may cause our actual results, level of activity, performance or achievements expressed or implied by any forward-looking statement to differ. These risks, uncertainties and other factors include, among other things, our critical accounting policies and: the ability of our preclinical studies to produce data sufficient to support the filing of global clinical trial applications and the timing thereof; our ability to continue to build and maintain the company infrastructure and personnel needed to achieve our goals; the clinical results and timing of our programs, which may not support further development of our product candidates; actions of regulatory agencies, which may affect the initiation, timing and progress of clinical trials; our effectiveness in managing current and future clinical trials and regulatory processes; the success of our platform in identifying viable candidates; the continued development and acceptance of nucleic acid therapeutics as a class of drugs; our ability to demonstrate the therapeutic benefits of our stereopure candidates in clinical trials, including our ability to develop candidates across multiple therapeutic modalities; our ability to obtain, maintain and protect intellectual property; our ability to enforce our patents against infringers and defend our patent portfolio against challenges from third parties; our ability to fund our operations and to raise additional capital as needed; and competition from others developing therapies for similar uses, as well as other risks and uncertainties under the caption “Risk Factors” contained in this Quarterly Report on Form 10-Q and in other filings we make with the SEC. Each forward-looking statement contained in this report is based on a combination of facts and factors currently known by us and our expectations of the future, about which we cannot be certain. As a result of these factors, we cannot assure you that the forward-looking statements in this report will prove to be accurate. Furthermore, if our forward-looking statements prove to be inaccurate, the inaccuracy may be material. In light of the significant uncertainties in these forward-looking statements, these statements should not be regarded as representations or warranties by us or any other person that we will achieve our objectives and plans in any specified timeframe, or at all. We caution you not to place undue reliance on any forward-looking statement. In addition, any forward-looking statement in this report represents our views only as of the date of this report and should not be relied upon as representing our views as of any subsequent date. We anticipate that subsequent events and developments may cause our views to change. Although we may elect to update these forward-looking statements publicly at some point in the future, we undertake no obligation to publicly update any forward-looking statements, whether as a result of new information, future events or otherwise, except as required by applicable law. Our forward-looking statements do not reflect the potential impact of any future acquisitions, mergers, dispositions, joint ventures or investments we may make. We are a biotechnology company with an innovative and proprietary synthetic chemistry drug development platform that we are using to rationally design, develop and commercialize a broad pipeline of first-in-class or best-in-class nucleic acid therapeutic candidates for genetically defined diseases. Nucleic acid therapeutics are a growing and innovative class of drugs that have the potential to address diseases that have historically been difficult to treat with small molecule drugs or biologics. Nucleic acid therapeutics, or oligonucleotides, are comprised of a sequence of nucleotides that are linked together by a backbone of chemical bonds. We are initially developing oligonucleotides that target genetic defects to either reduce the expression of disease-promoting proteins or transform the production of dysfunctional mutant proteins into the production of functional proteins. The nucleic acid therapeutics we are developing are stereopure. A stereopure oligonucleotide is comprised of molecules with atoms precisely arranged in three-dimensional orientations at each linkage. We believe that controlling the position of the sulfur atom following phosphorothioate (“PS”) modification will optimize the pharmacological profile of our therapeutics by maximizing therapeutic effect while minimizing the potential for side effects and safety risks. The stereopure therapies we are developing differ from the mixture-based nucleic acid therapeutics currently on the market or in development by others. Our preclinical studies have demonstrated that our stereopure nucleic acid therapeutics may achieve superior pharmacological properties compared with mixture-based nucleic acid therapeutics. Our platform is designed to enable us to rationally design, optimize and produce stereopure nucleic acid therapeutics, which were previously thought to be too difficult to make and too expensive to manufacture. Further, our platform has the potential to design therapies that use any of the major molecular mechanisms employed by nucleic acid therapeutics, including antisense, ribonucleic acid interference (“RNAi”), splicing and exon skipping. Our goal is to develop and commercialize disease-modifying drugs for indications with a high degree of unmet medical need in genetically defined diseases, and to become a fully integrated biotechnology company. We are focused on designing single-stranded nucleic acid therapeutics that can distribute broadly within the human body, allowing us to target diseases across multiple organ systems and tissues, through both systemic and local administration. Our initial focus for our clinical development programs is in neurology, which we broadly define as genetic diseases within the central nervous system and neuromuscular system. We have initiated clinical trials of our two lead programs in Huntington’s disease and our lead program in Duchenne muscular dystrophy (“DMD”) targeting exon 51. We are advancing three additional development programs, targeting exon 53 in DMD and C9ORF72 in amyotrophic lateral sclerosis and frontotemporal dementia, and, subject to our submission of clinical trial applications and approval to proceed, we would expect topline clinical data readouts from these programs in the second half of 2020. In addition to neurology, we are advancing discovery research in ophthalmologic disorders, specifically inherited retinal diseases, and in hepatic diseases, and we expect to make continued investments in expanding the breadth of our portfolio. In further support of our pipeline, we continue to make substantial investments in, and leverage, our platform to explore the next generation of stereopure nucleic acid therapeutics. We have also established and continue to enhance our internal cGMP manufacturing capabilities to increase control and visibility of our drug product supply chain. These investments further improve our ability to secure drug product for current and future development activities and may provide commercial-scale manufacturing capabilities. In Huntington’s disease (“HD”), we are advancing two programs, WVE-120101 and WVE-120102, each targeting a disease-associated single nucleotide polymorphism (“SNP”) within the huntingtin gene (“HTT”): rs362307 (“HTT SNP1”) and rs362331 (“HTT SNP2”), respectively. Targeting mRNA transcript with these SNPs allows us to lower the mutant allele transcript, while leaving the healthy transcript relatively intact. We commonly refer to this method (or approach) as “allele specific targeting.” SNPs are naturally occurring variations within a given genetic sequence and in certain instances can be used to distinguish between two related copies of a gene where only one is associated with the expression of a disease-causing protein. We have shown that by targeting HTT SNP1 and HTT SNP2 in preclinical in vitro studies, the production of disease-causing proteins associated with HD can be reduced. In July 2017, we initiated PRECISION-HD, a global clinical program consisting of the PRECISION-HD1 and PRECISION-HD2 clinical trials. PRECISION-HD1 and PRECISION-HD2 are two parallel, multicenter, double-blind, randomized, placebo-controlled Phase 1b/2a clinical trials evaluating WVE-120101 and WVE-120102, respectively, administered intrathecally, with single-ascending dose and multiple-ascending dose portions. The primary objective of these two trials is to assess the safety and tolerability of intrathecal doses of WVE-120101 and WVE-120102, respectively, in early manifest HD patients. Additional objectives include measurement of total HTT and mHTT, and exploratory pharmacokinetic, pharmacodynamic, clinical and MRI endpoints. Each trial is expected to enroll approximately 50 Stage I or Stage II HD patients, ages 25-65, who have screened positively for the presence of SNP1 or SNP2. Outside of the United States, we are enrolling patients in both the single-ascending dose and multiple-ascending dose portions of the PRECISION-HD1 and PRECISION-HD2 trials. In the United States, we received approvals to proceed with the single-dose portions of both trials. However, FDA indicated to us that we cannot progress to the multiple-ascending dose portions of these trials in the United States unless we conduct an additional preclinical study and present the resulting data to FDA for its review. For the single-dose portion of the PRECISION-HD1 trial in the United States, escalation to our highest proposed doses is subject to FDA’s review and approval of additional monitoring plans. We expect to deliver topline clinical data from the PRECISION-HD trials in the first half of 2019. In amyotrophic lateral sclerosis (“ALS”) and frontotemporal dementia (“FTD”), we are advancing WVE-3972-01, which preferentially targets the transcript containing the GGGGCC (“G4C2”) expansion in the C9ORF72 gene. WVE‑3972‑01 is designed to minimize the impact on normal C9ORF72 protein levels in patients, thereby reducing potential on-target risk. The G4C2 expansion in the C9ORF72 gene is the most common cause of familial ALS and FTD and is a strong genetic risk factor for non-inherited (sporadic) forms of ALS and FTD. Subject to our submission of clinical trial applications and approval to proceed, we would expect to deliver topline clinical data for WVE‑3972‑01 in the second half of 2020. Spinocerebellar ataxia 3 (“SCA3”) is a rare, hereditary (autosomal dominant), progressive, neurodegenerative disorder that is caused by a CAG-repeat expansion in the ATXN3 gene. We expect to have a SCA3 candidate targeting ATXN3 identified by the end of 2018. We are collaborating with Takeda Pharmaceutical Company Limited (“Takeda”) to advance genetically defined targets for the treatment of other CNS disorders, including Alzheimer’s disease and Parkinson’s disease. Under the terms of the agreement, we may collaborate with Takeda on up to six preclinical programs at any one time, during a four-year term. Takeda is entitled to exclusively license multiple preclinical programs from us during the term. Duchenne muscular dystrophy (“DMD”) is a genetic disorder caused by mutations in the DMD gene that result in dysfunctional dystrophin protein. DMD impacts approximately one in every 5,000 newborn boys each year, resulting in approximately 20,000 new cases worldwide annually. In DMD, we are advancing WVE-210201, which targets exon 51, a region within the precursor messenger RNA (“pre-mRNA”) that is transcribed from the dystrophin gene (also referred to as the “DMD” gene). In November 2017, we initiated a global, multicenter, double-blind, randomized, placebo-controlled, single-ascending dose Phase 1 clinical trial of WVE-210201 administered intravenously. The primary endpoint of the trial is safety and tolerability. The trial is expected to enroll approximately 40 patients, ages 5-18, who are amenable to exon 51 skipping. The Phase 1 inclusion criteria allow for participation by both ambulatory and non-ambulatory boys, as well as those previously treated with eteplirsen or ataluren following an appropriate washout period. Safety data from the Phase 1 clinical trial are anticipated by the end of the fourth quarter of 2018. As patients complete the Phase 1 trial, they have the option to enroll in an ongoing open label extension (“OLE”) study in which they continue to receive WVE-210201. The OLE is expected to enroll up to 40 patients who previously participated in the Phase 1 clinical trial. Patients in the OLE are undergoing quarterly clinical assessments using validated clinical outcome measures and are having muscle biopsies taken so that interim analysis may be conducted by measuring dystrophin expression using a standardized Western blot. We remain on track to deliver an interim analysis of dystrophin expression in muscle biopsies from our ongoing OLE in the second half of 2019. Our second development program in DMD, WVE-N531, targets exon 53. Subject to our submission of clinical trial applications and approval to proceed, we would expect to deliver topline clinical data for WVE‑N531 in the second half of 2020. Outside of DMD, we are conducting research to identify potential targets for other neuromuscular diseases where our novel platform technology, candidate discovery and rational design process may be most effective. We are designing and advancing stereopure oligonucleotide therapeutics for the potential treatment of rare, inherited eye diseases. Our research is assessing four inherited retinal diseases, which typically begin in childhood or adolescence and commonly lead to progressive vision loss: retinitis pigmentosa due to a P23H mutation in the RHO gene, Stargardt disease, Usher syndrome type 2A and Leber congenital amaurosis 10. Our preclinical data demonstrate that a single intravitreal injection of stereopure oligonucleotide in the eye of non-human primates resulted in greater than 95% knockdown of a target RNA in the retina for at least four months. Based on these data, we are working to design candidates that could achieve a therapeutic effect with only two doses per year. We expect to announce our first ophthalmology candidate in the second half of 2019. We are collaborating with Pfizer to advance genetically defined targets for the treatment of metabolic diseases, bringing together our proprietary drug development platform across antisense and single-stranded RNAi modalities, along with GalNAc and Pfizer’s hepatic targeting technology for delivery to the liver. Pfizer has selected five targets, including Apolipoprotein C-III (APOC3), which is the maximum number of targets that Pfizer may select under the terms of the agreement. We will advance five targets from discovery through the selection of clinical candidates, at which point Pfizer may elect to exclusively license the programs and undertake further development and potential commercialization. We have never been profitable, and since our inception, we have incurred significant operating losses. Our net loss was $108.8 million and $71.2 million in the nine months ended September 30, 2018 and 2017, respectively. As of September 30, 2018 and December 31, 2017, we had an accumulated deficit of $301.8 million and $192.7 million, respectively. We expect to incur significant expenses and increasing operating losses for the foreseeable future. We have not generated any product revenue since our inception and do not expect to generate any revenue from the sale of products for the foreseeable future. Our revenue during the nine months ended September 30, 2018 represents revenue earned under our two collaboration agreements: the Pfizer Collaboration Agreement (as defined in Note 4 in the notes to the unaudited consolidated financial statements appearing elsewhere in this Quarterly Report on Form 10-Q (“Note 4”)), which was entered into in May 2016, and the Takeda Collaboration Agreement (as defined in Note 4), which became effective in April 2018. Our revenue during the nine months ended September 30, 2017 represents revenue earned under the Pfizer Collaboration Agreement only. The only revenue generating license or collaboration agreements to which we are currently a party are the Pfizer Collaboration Agreement and the Takeda Collaboration Agreement. Our operating expenses since inception have consisted primarily of research and development costs and general and administrative costs. facility-related expenses, including rent, maintenance and other general operating expenses. We recognize research and development costs as incurred. We recognize external development costs based on an evaluation of the progress to completion of specific tasks using information provided to us by our vendors. Payments for these activities are based on the terms of the individual agreements, which may differ from the pattern of costs incurred, and are reflected in our financial statements as prepaid or accrued expenses. Our primary research and development focus since inception has been the development of our innovative and proprietary synthetic chemistry drug development platform. We are using our platform to design, develop and commercialize a broad pipeline of nucleic acid therapeutic candidates. Our research and development expenses consist primarily of expenses related to our CROs, CMOs, consultants, other external vendors and fees paid to global regulatory agencies to conduct our clinical trials, in addition to compensation-related expenses, facility-related expenses and other general operating expenses. These expenses are incurred in connection with research and development efforts and our preclinical and clinical studies. We track certain external expenses on a program-by-program basis. However, we do not allocate compensation-related expenses, internal manufacturing expenses, equipment repairs and maintenance expense, facility-related expenses or other operating expenses to specific programs. These expenses, which are not allocated on a program-by-program basis, are included in the “Other discovery and development programs, platform development and identification of potential drug discovery candidates” category along with other external expenses related to our other discovery and development programs, as well as platform development and identification of potential drug discovery candidates. Product candidates in later stages of clinical development generally have higher development costs than those in earlier stages of clinical development, primarily due to the increased size and duration of later-stage clinical trials. We expect that our research and development expenses will continue to increase in the foreseeable future as we continue to manage our existing clinical trials, initiate additional clinical trials for certain product candidates, pursue later stages of clinical development for certain product candidates, further expand our manufacturing capabilities and continue to discover and develop additional product candidates in areas including neurology, ophthalmology and hepatic. General and administrative expenses consist primarily of compensation-related expenses, including salaries, bonuses, share-based compensation and other related benefits costs for personnel in our executive, finance, corporate, legal and administrative functions, as well as compensation-related expenses for our board of directors. General and administrative expenses also include legal fees; expenses associated with being a public company; professional fees for accounting, auditing, tax and consulting services; insurance costs; travel expenses; other operating costs; and facility-related expenses. We anticipate that our general and administrative expenses will increase in the future, primarily due to additional compensation-related expenses, including salaries, benefits, incentive arrangements and share-based compensation expense, as we increase our employee headcount to support the expected growth in our research and development activities and the potential commercialization of our product candidates. Other income (expense), net consists mainly of dividend and interest income earned on cash and cash equivalents balances. We are a Singapore multi-national company subject to taxation in the United States and various other jurisdictions. The income tax provision recorded during the nine months ended September 30, 2018 was mainly the result of return to provision adjustments related to the filing of our Japanese subsidiary’s 2017 tax return. The income tax provision recorded during the nine months ended September 30, 2017 was primarily the result of the establishment of a valuation allowance against our U.S. deferred tax assets. Our consolidated financial statements are prepared in accordance with generally accepted accounting principles in the United States of America. The preparation of our financial statements and related disclosures requires us to make estimates and assumptions that affect the reported amount of assets, liabilities, revenue, costs and expenses and related disclosures. Our significant accounting policies, judgments and estimates are described in Note 2 in the 2017 Annual Report on Form 10-K, as well as under the header “Revenue Recognition” in Note 2 in the notes to the unaudited consolidated financial statements appearing elsewhere in this Quarterly Report on Form 10-Q (“Note 2”). We believe that these identified policies are critical to fully understanding and evaluating our financial condition and results of operations. Furthermore, we believe that of our significant accounting policies, the estimates and assumptions involved in our revenue recognition policy, particularly (a) assessing the number of performance obligations; (b) determining the transaction price; (c) allocating the transaction price to the performance obligations in the contract; and (d) determining the pattern over which performance obligations are satisfied, including estimates to complete performance obligations; involve a greater degree of judgment, and therefore we consider it our critical accounting policy. We evaluate our estimates and assumptions on an ongoing basis. Our actual results may differ from these estimates under different assumptions and conditions. Our critical accounting policy of revenue recognition changed during the nine months ended September 30, 2018, due to our adoption of ASC 606 (as defined in Note 2) on January 1, 2018, which is discussed in detail in Note 2. Revenue of $4.5 million for the three months ended September 30, 2018 was earned under the Pfizer Collaboration Agreement and the Takeda Collaboration Agreement. Revenue of $1.3 million for the three months ended September 30, 2017 was earned under the Pfizer Collaboration Agreement only. The $3.2 million increase year over year was due to increased revenue earned under the Takeda Collaboration Agreement, which became effective in April 2018. Revenue for both periods is presented under ASC 606.
an increase of $7.3 million in internal and external research and development expenses that are not allocated on a program-by-program basis and are related to other discovery and development programs, platform development and identification of potential drug discovery candidates, due to an increase of $3.2 million in compensation-related expenses, which is the result of organizational growth, an increase of $3.3 million in research and development supplies and services expenses and other operating expenses and an increase of $0.8 million in facility-related expenses. General and administrative expenses were $9.8 million for the three months ended September 30, 2018, as compared to $7.6 million for the three months ended September 30, 2017. The increase of $2.2 million was primarily due to a $1.6 million increase in compensation-related costs resulting from an increase in employee headcount. Increased professional services expenses and other general and administrative operating expenses account for the remaining increase of approximately $0.6 million. During the three months ended September 30, 2018 and 2017, we recorded no income tax benefit or provision and an income tax benefit of $0.4 million, respectively. No income tax benefit or provision was recorded during the three months ended September 30, 2018 as a result of having a full valuation in all jurisdictions. The income tax benefit recorded during the three months ended September 30, 2017 was the result of the implementation of a revised international corporate structure aligned with our international operations. We recorded no income tax benefits for the net operating losses incurred during the three months ended September 30, 2018 in Singapore, the United States, the United Kingdom or Ireland, due to uncertainty regarding future taxable income in these jurisdictions. We recorded no income tax benefits for the net operating losses incurred during the three months ended September 30, 2017 in Singapore, Japan, the United Kingdom or Ireland, due to uncertainty regarding future taxable income in these jurisdictions. Revenue was earned under the Pfizer Collaboration Agreement, which was entered into in May 2016, during the nine months ended September 30, 2018 and 2017. Additionally, during the nine months ended September 30, 2018, revenue was earned under the Takeda Collaboration Agreement. There was $10.8 million in revenue for the nine months ended September 30, 2018, which represents an increase of $8.0 million in revenue over the $2.8 million in revenue for the nine months ended September 30, 2017. The increase year over year was due to revenue earned under the Takeda Collaboration Agreement, which became effective in April 2018, as well as increased revenue earned under the Pfizer Collaboration Agreement. Revenue for both periods is presented under ASC 606.